After a long, hot afternoon in the vineyard, I was ready for a glass of something cold. 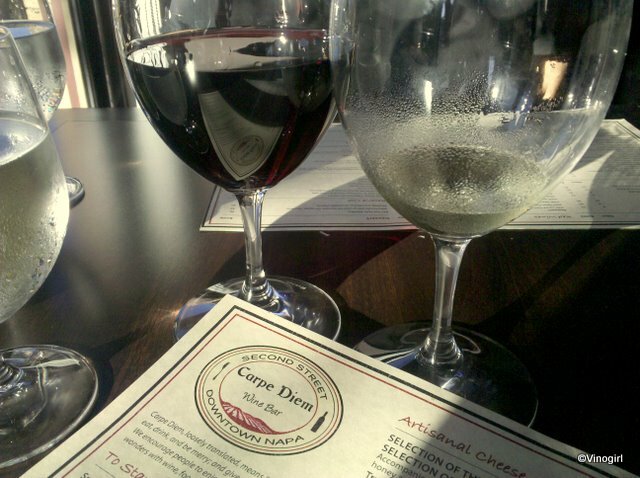 So off Vinomaker and I went to experience happy hour in a new wine bar in downtown Napa, Carpe Diem. We had such a good time; we partook in a quick, New Zealand versus Napa, Sauvignon blanc taste-off (we nailed it), had some great bar appetizers (Kobe corn dogs, anyone? ), and tasted a few unusual wines (by the glass) that we might not have otherwise experimented with. We were taken care of by the cheerful, capable and lovely Stephanie, a co-owner in this welcome addition to the city of Napa. I sincerely hope Stephanie and her partners are successful with their new business venture, these young entrepreneurs deserve to succeed. Today, I did a bit of moonlighting. A good friend (who also happens to be a great winemaker) asked me to help out with a group of 120 pharmaceutical executives that she was hosting at her winery. It's not a huge stretch of the imagination to anticipate that large groups of people, drinking alcohol, can sometimes become a little unruly. The task of keeping that many people focused on the wines, the winemaker's story, and the greater Napa Valley experience can often seem a little like herding cats. However, the event went extremely smoothly and all the executives departed with smiles on their faces. It was fun to do something other than my everyday routine. Seriously, who'd want to? Not me. It looks like the European Grapevine Moth is being held at bay; so far, so good. This insect trap, set by Napa County, seems to have captured nothing more egregious than a particular species of Cicadellidae and some Diptera. Thank goodness...Vinoland may survive the EGVM onslaught. Does your wine deserve this? On arrival at yesterday's Cause for the Paws event, wine-tasters were issued logoed GoVino glasses with which to enjoy as many, or as few, of the wines that were available for tasting. These glasses are stemless, lightweight, and convenient, or as the GoVino website touts, "elegant, shatterproof, reusable, and recyclable." Everything you'd want in a glass, right? Except for one thing - they reek of plastic! Even the most herbaceous of the Sauvignon blancs I tasted could not mask the stench of the apparently food safe PETG that these glasses are made of, despite a claim on the company's website that they are manufactured from an odourless polymer. The ergonomic thumb-notch is a nice touch, but my black Riedel stemless tasting-glasses also have this feature and they are made of, well, glass. Last year glass stemware was the wine receptacle of choice. This year the hosts of the event saved themselves the time and the cost of cleaning hundreds of glasses - at the expense of the taste of the wine. The folks at GoVino say "your wine deserves it!" I don't think so. This afternoon, Vinomaker and I attended the 2010 Cause for the Paws. I must admit it wasn't quite as much fun as last year, however this year the weather was more cooperative - it was a fair bit cooler and so overall it was a most enjoyable day. This event, benefiting Napa Humane, is another fantastic opportunity to taste some of the best wines that Napa and Sonoma have to offer, all in one location. The wineries that participate are very generous in donating their time and copious amounts of wine to this worthy cause. I took some photographs of several of the dogs that were up for adoption and were being walked around by volunteers at the event. But the poor poochies looked too depressed for me to employ one of their images for this post. Instead, I chose to use a photo of one of the more whimsical wine labels on display, gracing a fairly decent bottle of Sauvignon blanc from Mutt Lynch Winery. The label announces, "...she's amazing, she's eccentric, some might say she's barking mad..." This could have been written about me! I don't know why people buy pedigree puppies when there are so many abandoned, hapless dogs out in the world that are in need of a good home. Just a thought. Aside from me not wanting to aid in the perpetuation of problems caused by unsound breeding practices and being complicit in keeping disreputable puppy-mills in business, I will always choose a mongrel over a pedigree for many other reasons. Lest you think me altruistic and principled, let me assure you that my intentions are purely selfish. As a rule mongrels generally live longer, are healthier, and for me are more entertaining than a recognised breed, (you just don't know exactly how that funny little bundle of fluff is going to grow up.) I want the current, and future, incarnations of Vinodogs to be around for as long as canine-ly possible. I should be well into the pile of books I put aside for my summer reading by now, but I'm a little behind. I have however started with the book on top - Garlic, Wine and Olive Oil by Thomas Pellechia - and I am quite enjoying it. How could I not, it is a book about three of my favourite things; garlic, wine, and olive oil...yum. If only it had a chapter about dogs. My favourite colour of flowers is blue; forget-me-nots, delphiniums, lobelia, bluebells...you pick any blue flower, I'll love it! Agapanthus and cornflowers are prodigiously blooming around Vinoland right now and they look so pretty. So, it goes without saying that one of my favourite weeds is common chicory (Cichorium intybus) because it too has a blue bloom. Chicory has a deep taproot which can penetrate the hardest of soil types and can be useful as a vineyard cover crop. This beneficial weed can be planted to aid in the management of deficit vineyard irrigation programmes because it can apparently improve wine quality in overly vigorous vineyards (think reduced malic acid and methoxypyrazine levels in Cabernet sauvignon.) It is also very drought resistant, which is probably the reason it grows so successfully, and abundantly, along roadsides this time of year. However, it is a tall weed so don't expect to easily navigate any vineyard that is planted to chicory. The taproot of chicory is also cultivated as a coffee substitute. Does anyone remember Camp Coffee? Growing up, there was always a bottle that lurked in the back of a cabinet in my mother's kitchen. It may still be there! The little something that Vinomaker picked up at the Home Winemakers Classic just so happened to be a 3L bottle of 2006 David Arthur Elevation 1147. Vinomaker was the only bidder for this particular auction lot, not because it is a bad wine, but rather as the result of a slightly bizarre instance of being in the right place at the right time. For a bargain basement price the Elevation 1147 is now settling into it's new home in Vinoland. I have had this wine on several occasions and have always found it to be very pleasant. I am sure I will enjoy this bottle in the future, especially knowing what a great deal Vinomaker got. Vinomaker, my mother and I attended the 28th annual Home Winemakers Classic which was hosted at a new locale this year, an event facility in the town of Yountville. This annual charity fundraiser attracts a lot of people. I personally found the wine-tasting area at the new venue to be a little awkward to navigate because the flow of the crowd was interrupted by tables at right angles to each other. However, the best thing about the move, from St. Supery Winery to the Groezinger Estate, was that the silent auction wine lots were now indoors... in air-conditioning, a much needed improvement over previous years when temps got so high that the corks in many of the bottles on display had pushed out up to half an inch. Who would want to bid on such potentially spoiled wines? Vinomaker picked up a little something in the silent auction as he likes to support worthy causes such as the Dry Creek - Lokoya VFD...or maybe it was the swift elbow to his ribs! Thud fed the entire family, including the Vinodogs (who were very happy under-the-table poochies), this evening...and considering we all stuffed ourselves silly, we barely made an impression on the massive pan of baked ziti with meatballs. Washed down with a full-bodied Fruili vino, a splendid time was had by all. Leftovers for lunch tomorrow? Of course. Teak a look at this. Whilst out shopping with my mother, I came across this forlorn looking 375 ml bottle of 1975 Chateau Musar in a patio furniture emporium. Having only my phone with me, I took a quick snap of this once proud, now crestfallen wine relegated to being a mere prop on a circular teak table, but not before I caught the attention of the shop owner. I then endured a 5 minute long dissertation on the merits of a another table (that I feigned interest in) and it's 6" by 2" teak plank top. Not about to fork out $2500 for the aforementioned table, I finally summoned up the courage to inquire as to the provenance of the dejected looking baby-bottle of wine. 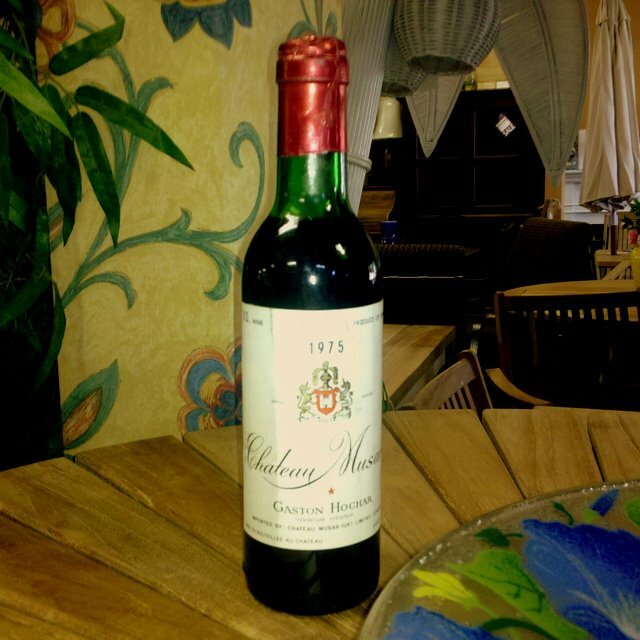 It was indeed a genuine bottle of Chateau Musar purchased from Sotheby's in New York by a wine-loving friend of the table-touter. Having shared many wonderful bottles of Musar in the past with my brother and Lord Roby, I left the store feeling rather glum - I do tend to be overly anthropomorphic. What a sad fate to befall this diminutive bottle of wine which once had the potential of being set upon a tabletop as the star of the show, only to be demoted to a supporting role. Wine is meant to be enjoyed...not displayed. Vinogirl was rooting for Spain. Thud was cheering on Holland. Somebody had to win. The Rioja was pretty tasty. The Heineken mini-keg remains unopened! Fruit set in Vinoland's Pinot gris block seems to have been very successful in 2010: the fruit looks fabulous. The vines are nearing a transitional period right now - moving away from the stage when vegetal growth dominates to the stage that favours the enlargement and maturation of the fruit. I never get bored with observing the entire process. Vinomaker is out in the vineyard applying the final sulphur application for this year (for which he is very grateful.) He went to a meeting last night about the European Grapevine moth, so I need to debrief him as to the latest on this bothersome pest...it's a war out there people! People unfamiliar with the San Francisco Bay Area's micro-climates find it hard to believe that there is a wide range of diurnal temperatures in the Napa Valley also. 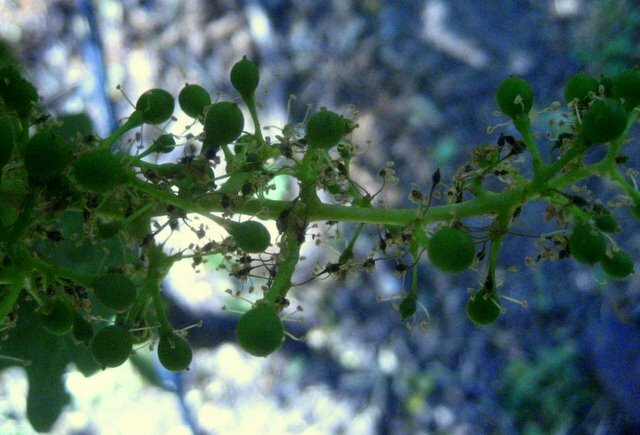 A friend, who grows Cabernet sauvignon (Clone 7) up in St. Helena, sent me this photograph last weekend of what he originally thought was a grapevine disease. It turns out that his vineyard, that on any given day can be 5-10 degrees warmer than Vinoland, had just experienced a major hiccup in the transition from flower to berry known as shatter. Fruit set is the stage of berry development 1 to 3 weeks after bloom when most flowers have fallen and those that remain, about 30-60%, develop into berries. Shatter is the detachment of berries from the cluster at the pedicel base (the dark, necrotic tissue in photograph), after the fruit set stage. It appears that the poor fruit set, in this particular vineyard, was the result of dry conditions and high temperatures at bloom. However, shatter can also be exacerbated by variety (Merlot is particularly susceptible), vine vigour, and disease. What does all this mean? Well, shatter causes widespread yield losses, which in this instance means a diminished crop from which to make wine at harvest time. The fruit set in Vinoland looks solid so Vinomaker will not be without plenty of grape juice to vinify. But he is mourning the loss of those Clone 7 grapes that fell victim to shatter, especially since the 2009 crop surrendered up the best Cabernet of the vintage.